Decorating a patio is always a fun thing to do. 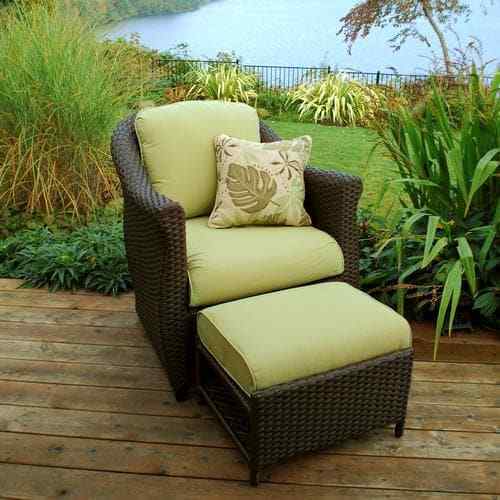 Besides those outdoor furniture pieces, you can add lots of décor items to make it look and feel more inviting. For sure, you can just buy the patio decoration stuff in the market by spending some bucks. However, you have to spend quite a lot especially if you want to have the sophisticated ones. 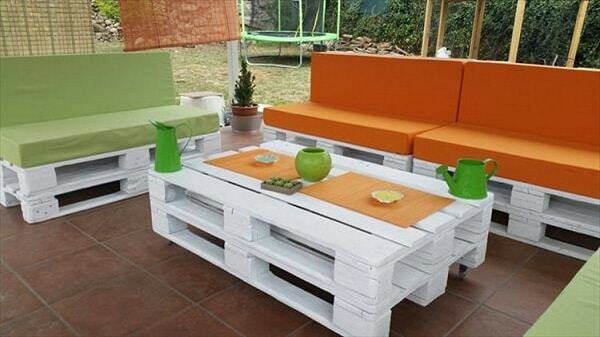 Therefore, making some things to decorate your patio by yourself at your home sound so fun to do. You can use some easily available materials without costing you a lot. 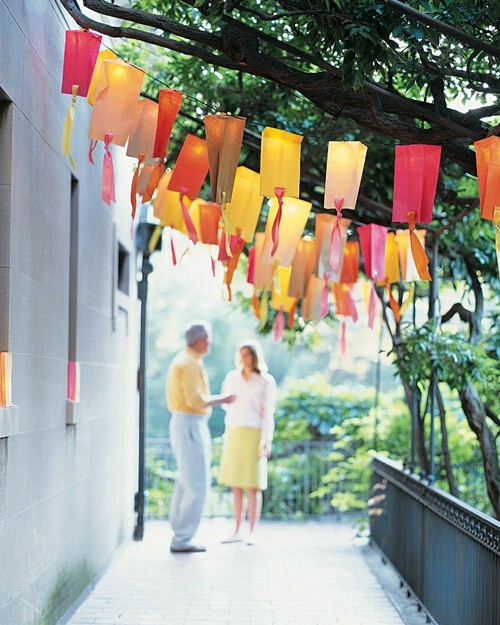 Here, we have dozens of DIY patio decoration ideas that will inspire you to make one. 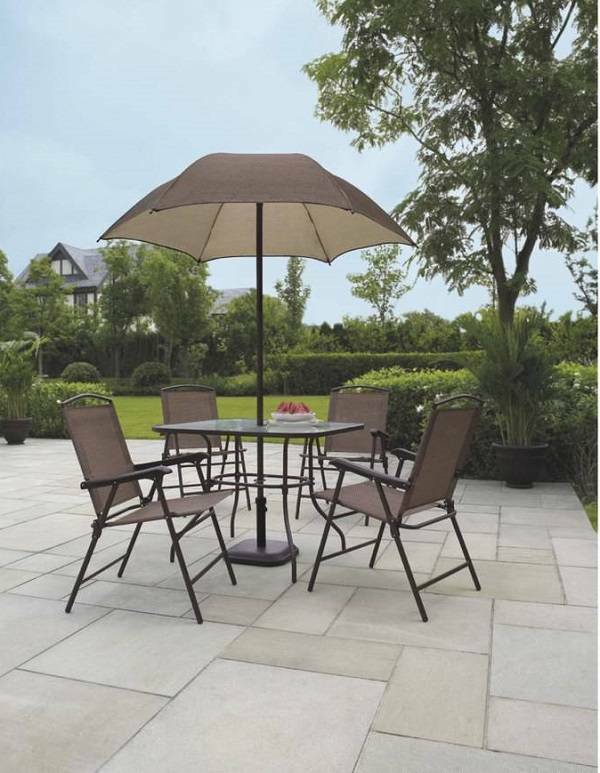 They will make your patio look more stylish and provides some additional function on your patio. Well, let’s just keep scrolling to check our DIY patio decoration ideas! 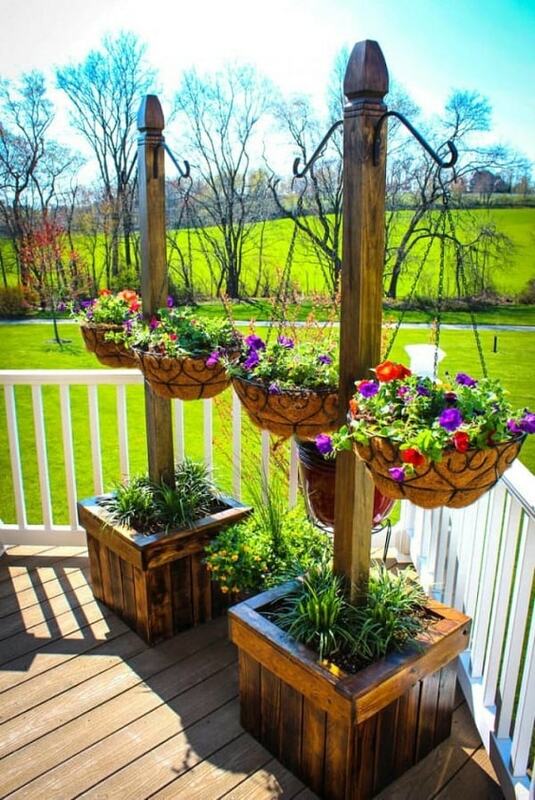 The gorgeous planter with a stand-alone design which is made of some woods and hanging coir baskets. 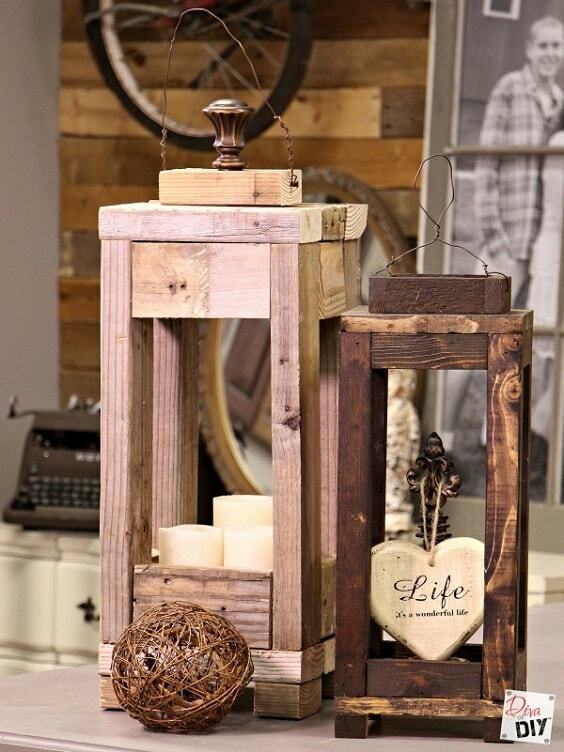 You’ll need to make two boxes out of woods and the pillars to hang the basket. 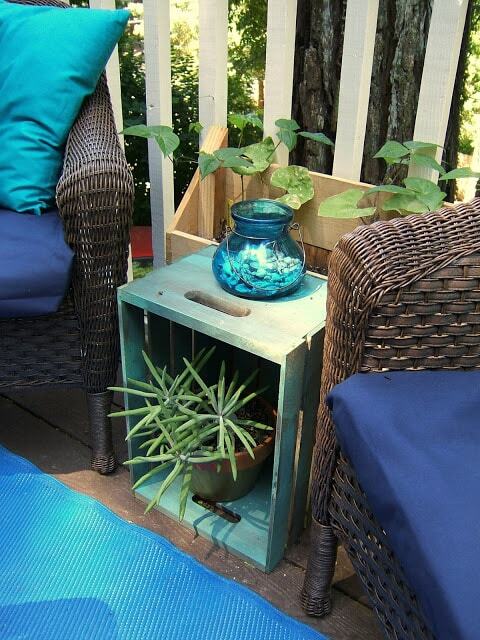 This DIY patio decoration ideas will provide a nice convenient storage on your patio. 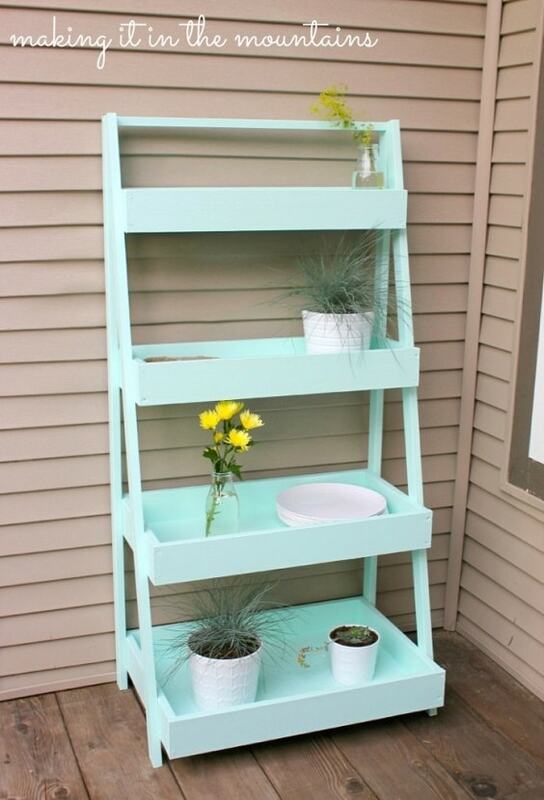 It’ made in a ladder design so you can put lots of outdoor stuff or display some décor items on each step. 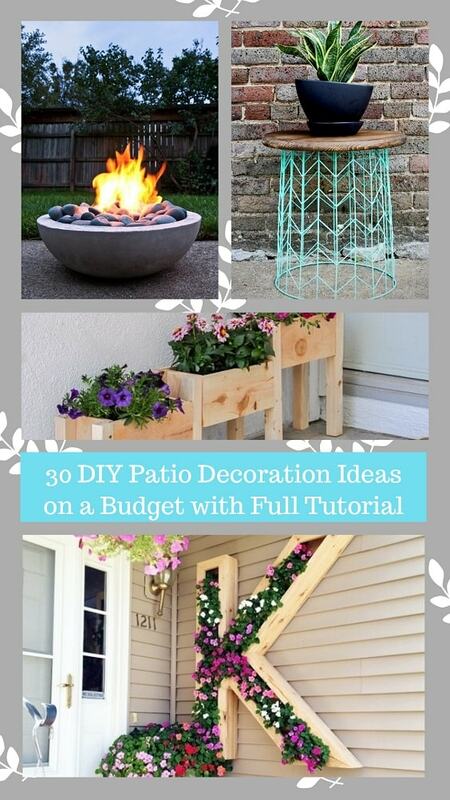 The beautiful DIY patio decorating ideas which will work to lighten up your patio It’s made of the tiki torch with the huge concrete planter as its base. 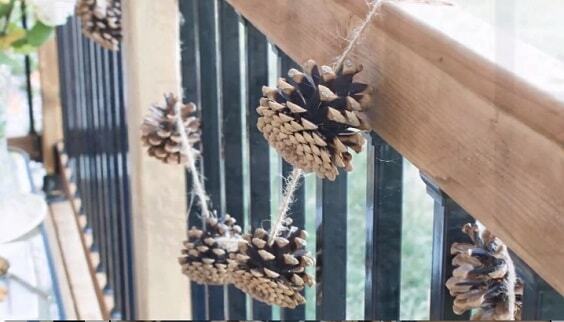 One of the most popular DIY patio decoration ideas is by making a hanging planter to give a more natural look, but this inspiration comes with a more distinctive design. 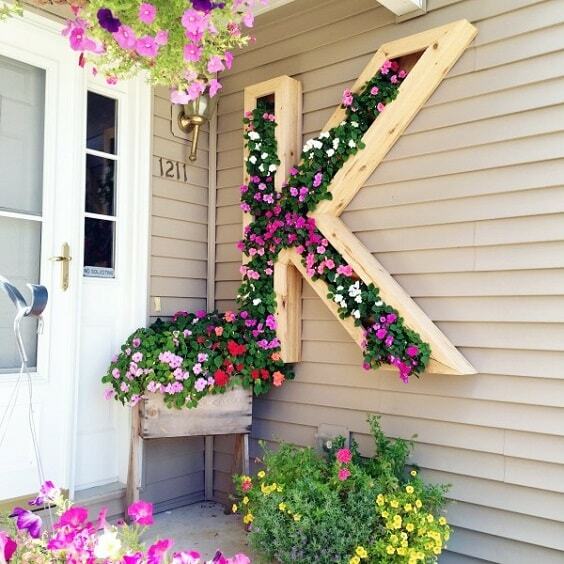 It’s a monogram hanging planter which will give such a unique touch to your patio, especially those which are extended from the back wall. 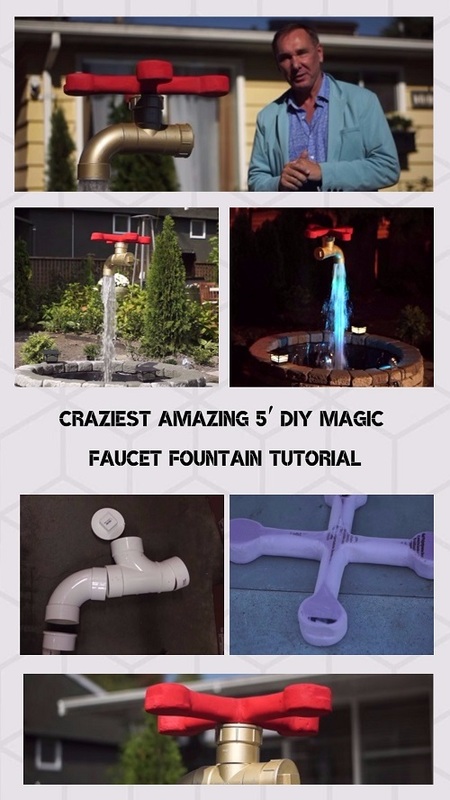 A unique DIY patio decorating ideas which will bring the style of your patio to a whole new level. 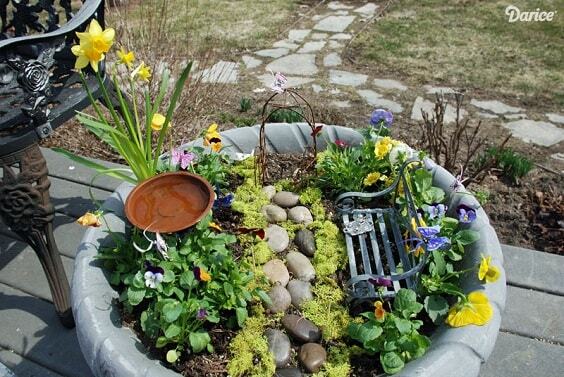 It’s a garden miniature which is made of a large pot, some toys, and flowers which look so beautiful. 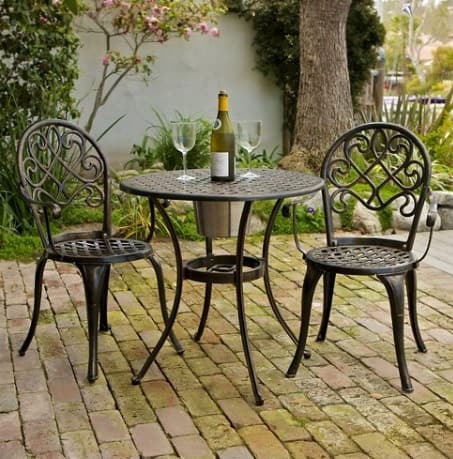 The gorgeous bar table to make your patio look and feel more inviting. 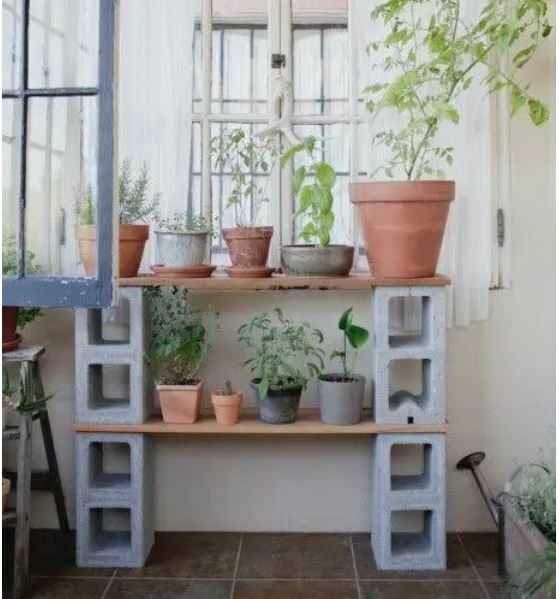 The materials that you will need for this DIY patio decoration ideas are some wood pallets and the concrete pavers on its top. 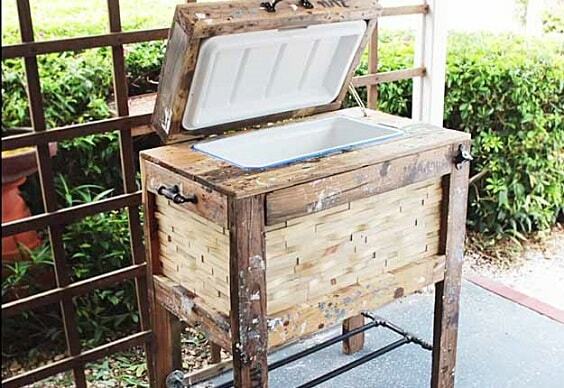 This DIY patio decoration ideas will make your cooler box look way more distinctive. It’s covered with the wood and designed with the portable construction to make it more convenient to use. 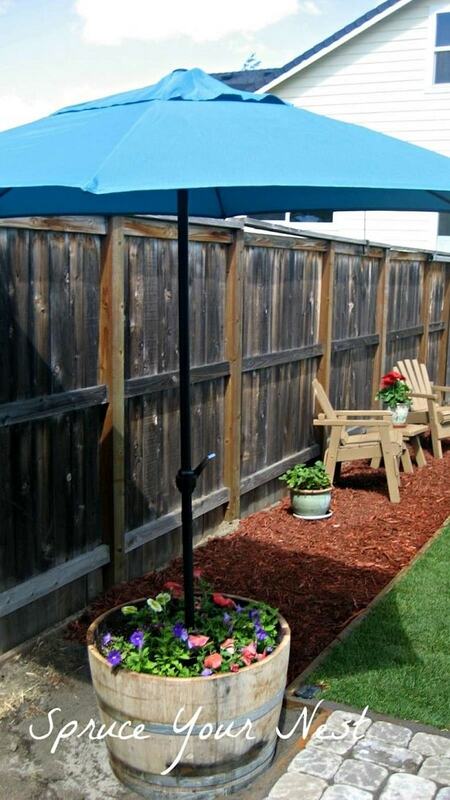 If you have built a pathway which leads to your patio, this DIY patio decoration ideas is a great one to try. 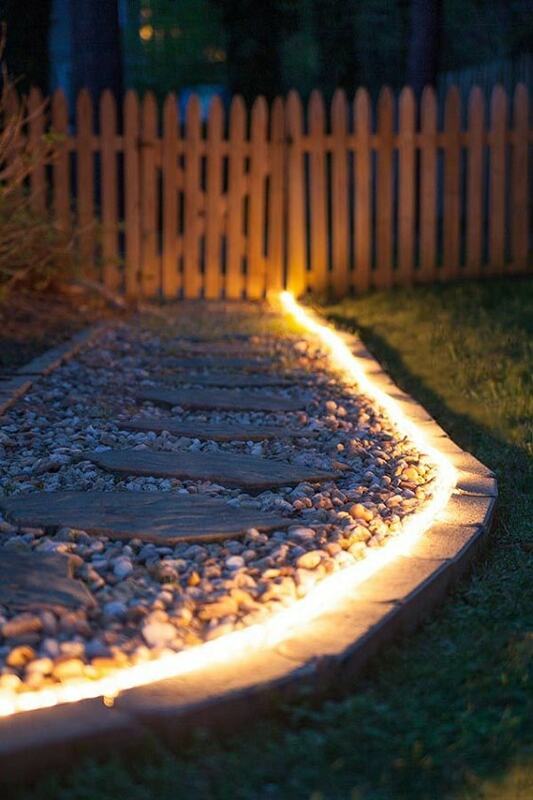 The project uses a string light which will brighten up your pathway beautifully. For you who want to give such an industrial look to your outdoor living space, this DIY patio decoration ideas can be your top choice. 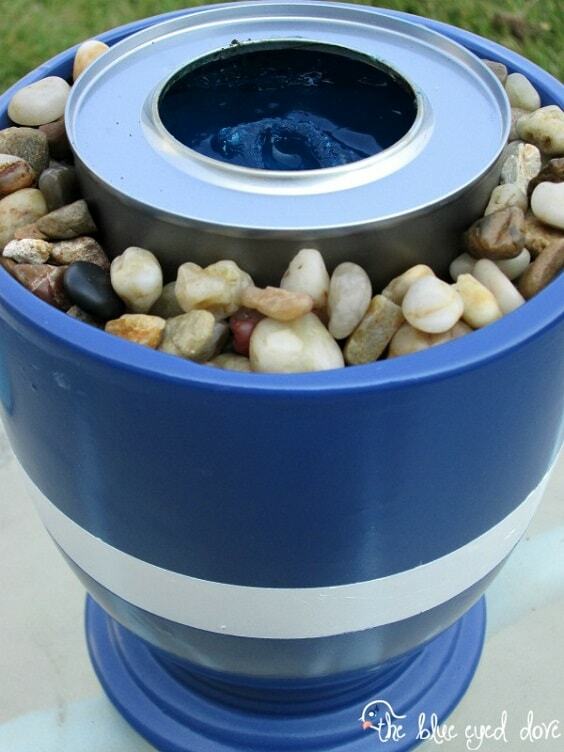 The planters are made of ammunition can which will make your patio look beautifully distinctive. 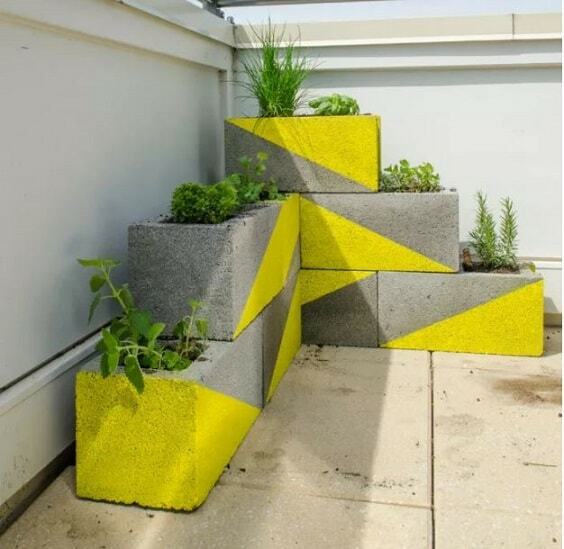 The colorfully attractive DIY patio decoration ideas which are made from cinder blocks to include on your project list. 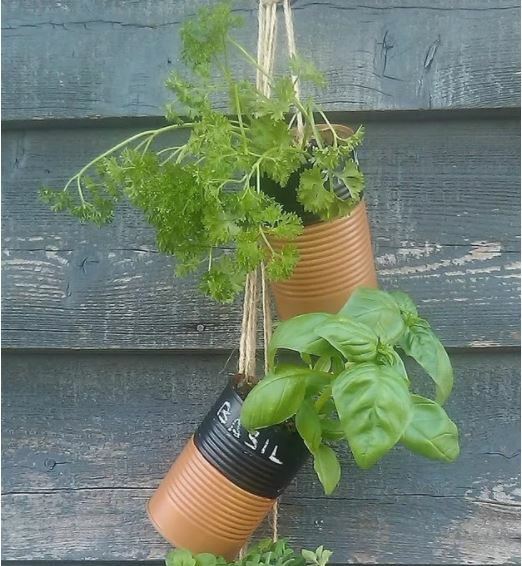 It’s used as the planters for greeneries so it can be a good option for you who want to put some plants in the more stylish way. Another DIY patio decoration ideas to make a stand-alone planter which is so tempting to try to enhance the beauty of your backyard. This one uses chain link and wood as its materials which are designed in a pergola look. 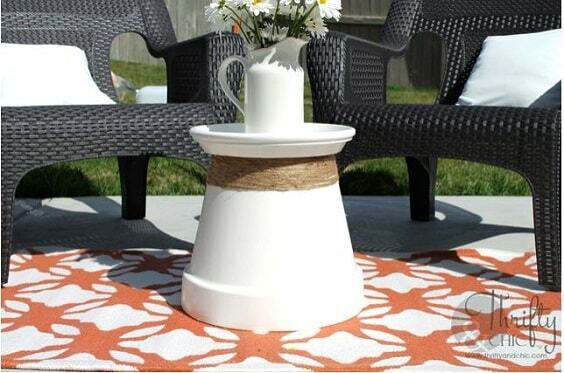 This one is an effortless DIY patio decorating ideas which is made of the terracotta pot. You just have to simply give the pot the finish as you desired then put the pot and the base in reversed position. 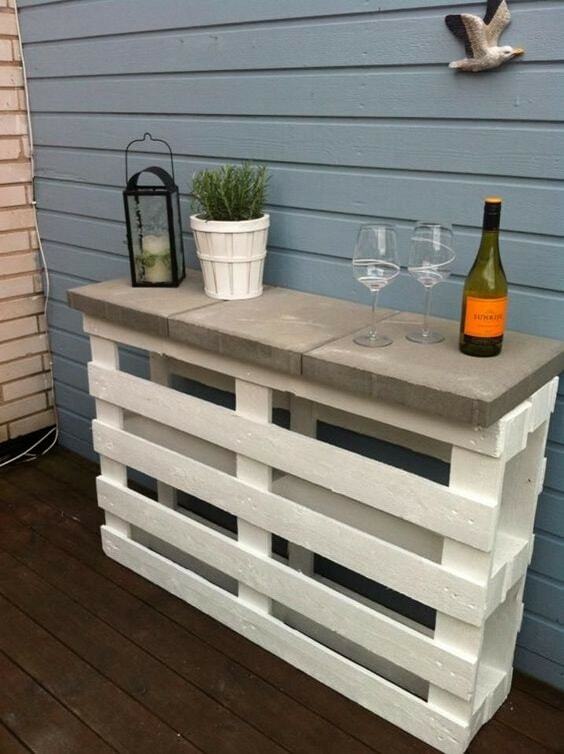 Yeap, the used shipping wood pallet is always the DIY projects’ best friend which is s easy to turn into almost everything. 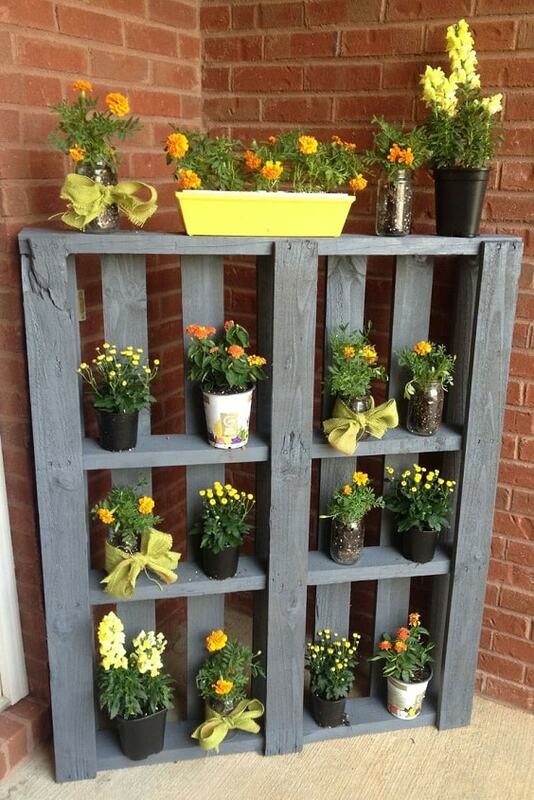 Here, the pallet is made as the open shelf to display the flowers beautifully. 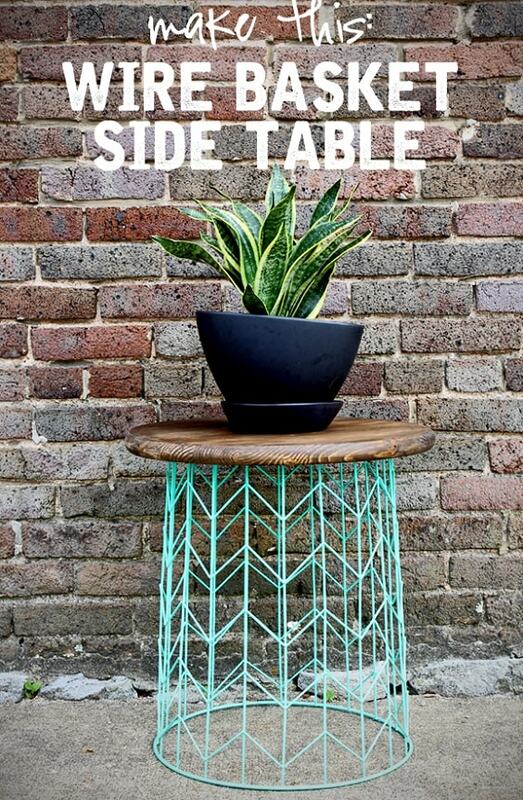 Another easy and cheap DIY patio decoration ideas to make an adorable accent table which uses some easily available materials. For this one, you will need to prepare a wire basket and round wood tray. Turn your old wine barrel to a gorgeous planter which also works as the base of an outdoor umbrella. 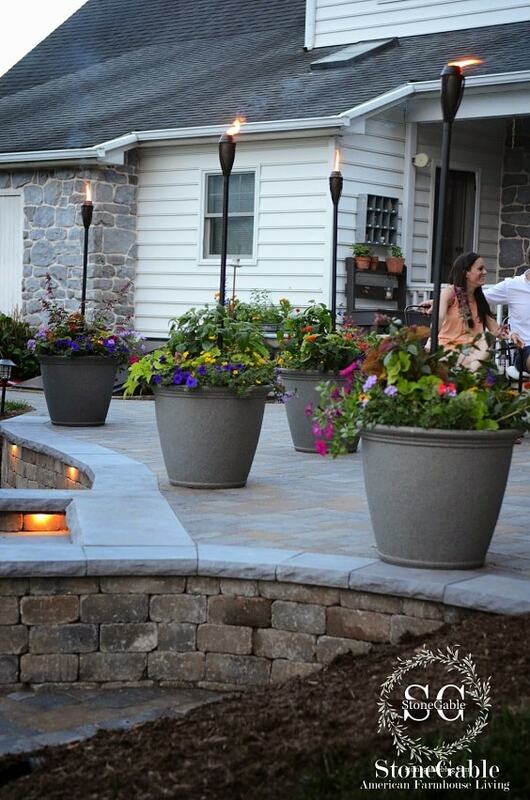 The planter looks beautifully rustic to add some farmhouse touch to your patio. 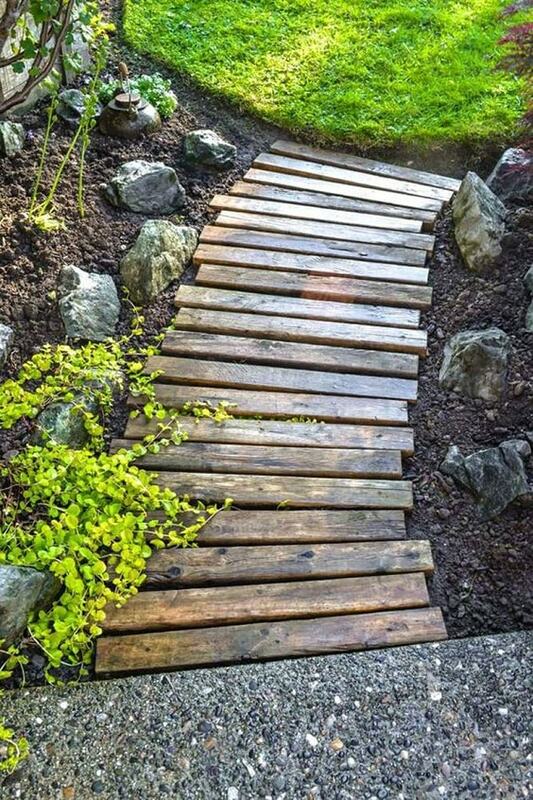 There are so many ways to create a beautiful pathway which connects the back of your house to the patio, and this DIY patio decorating ideas is the one that you can’t miss. You will need some wood planks. If the huge firepit doesn’t really work well for your small patio, then you have to include this DIY patio decoration ideas on your top list. Here, the small ceramic pots, small rocks, and chafing fuel container are used to make a small firepit. 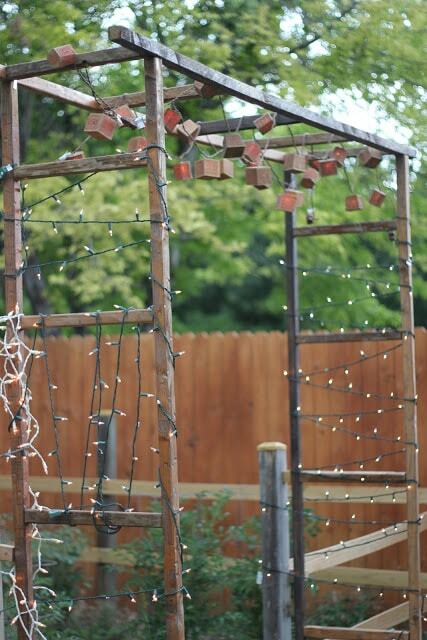 The distinctively beautiful pergola in ladder design which is completed with the string light. It’s such a nice inspiration to add a unique lighting to your patio. 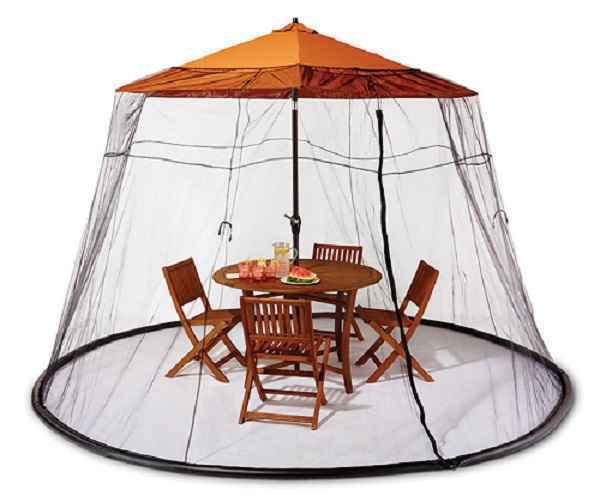 For sure, having a patio accessory which will warm you when you enjoy some outdoor time during the night is always tempting. 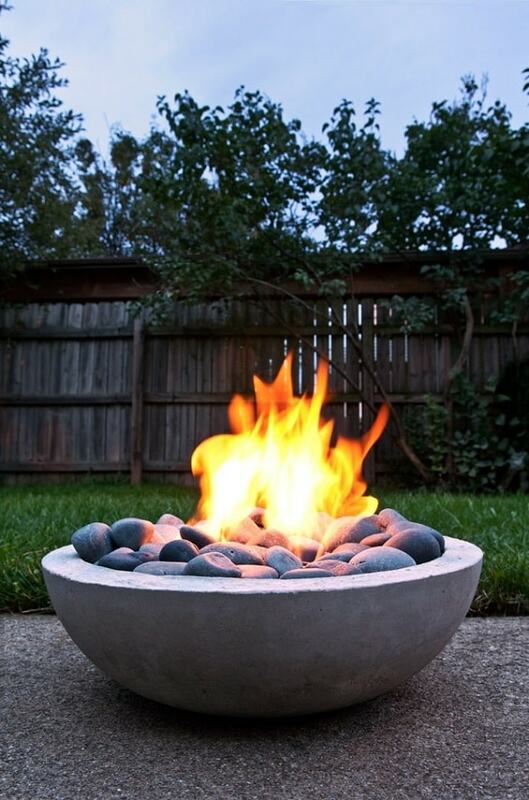 This one is another DIY patio decoration ideas to make a fire bowl which looks so stylish. 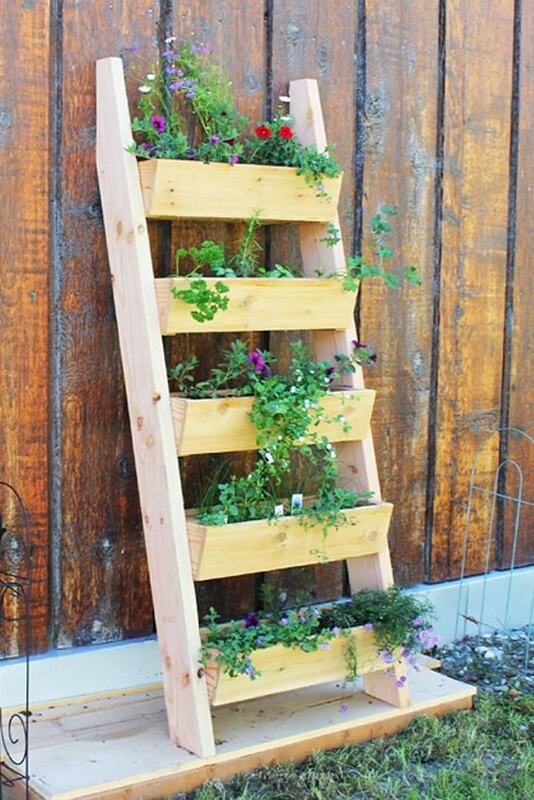 A lovely planter in ladder design which is all made out of wood to enhance the beauty of your patio. 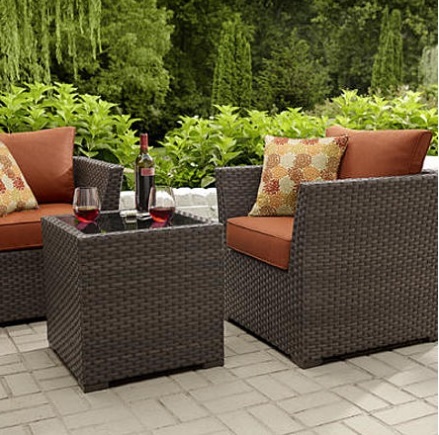 Its size makes it can cope with various kinds of the flower with different colors that will add a colorful touch to your outdoor living space. The unique addition for your patio which doesn’t only beautifully decorate it but also gives some attractive light during the night. It’s made of a glass wine bottle and some copper stuff to hang it. If your patio is shaded with a pergola, you can complete the look with this DIY patio decoration ideas which use some super cheap materials. 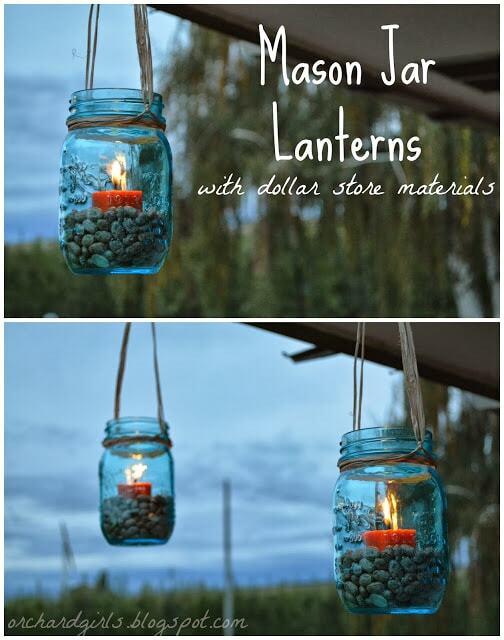 You will need to prepare some cute mason jars, raffia, candle, and rocks to make this adorable hanging lantern. This one is for you who are looking for a piece-of-cake DIY patio decorating ideas yet with a superb result. 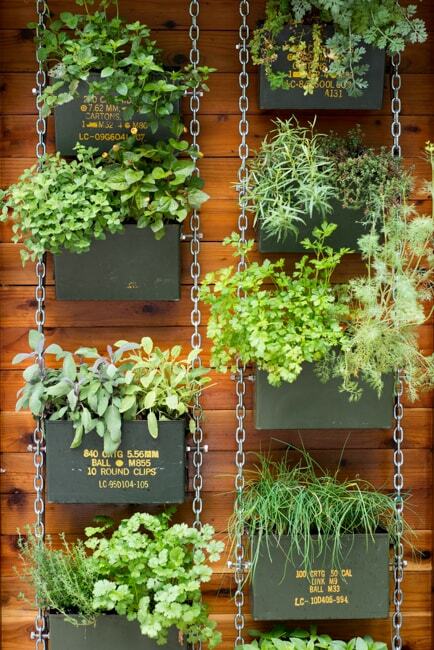 It’s an open shelf which works to arrange your planters beautifully. 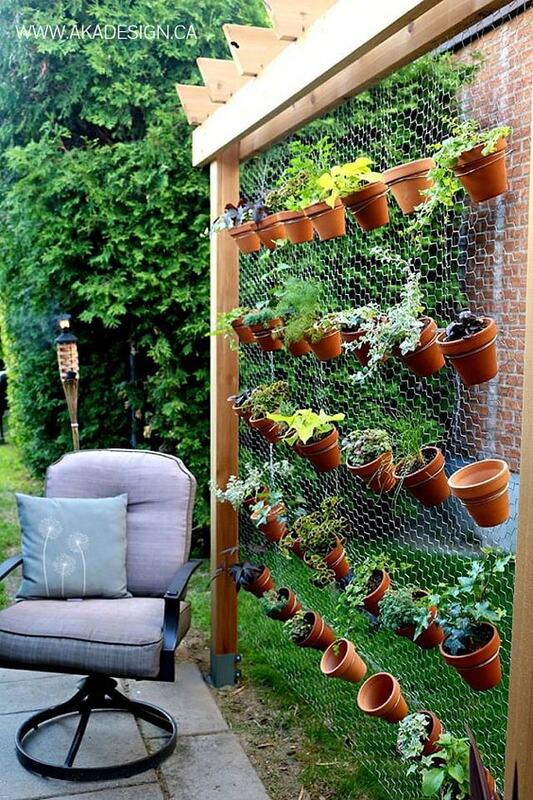 The hanging garden which uses the used soup cans as the material. You just need to give the cans some attractive finishes then hang them by using the twines. 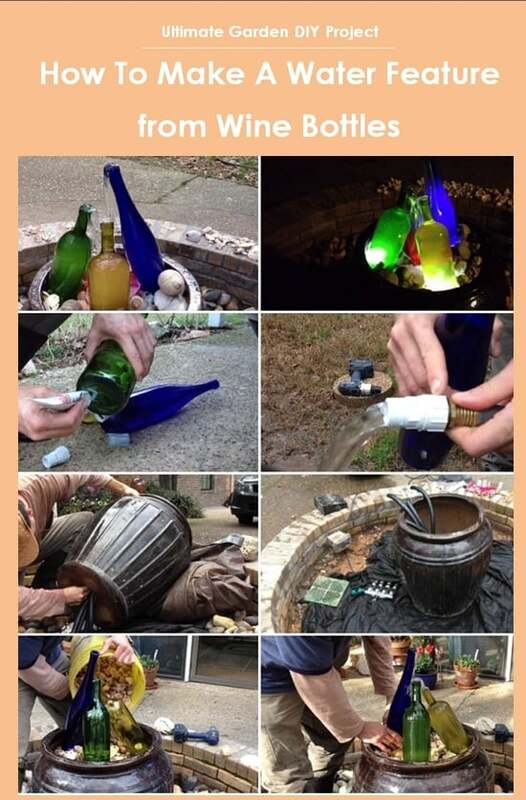 If you think that the string light looks too boring to decorate your patio, then this DIY patio lighting ideas is a good choice to try. The materials that you will need to make the light are string light, paper bags, and some ribbon. 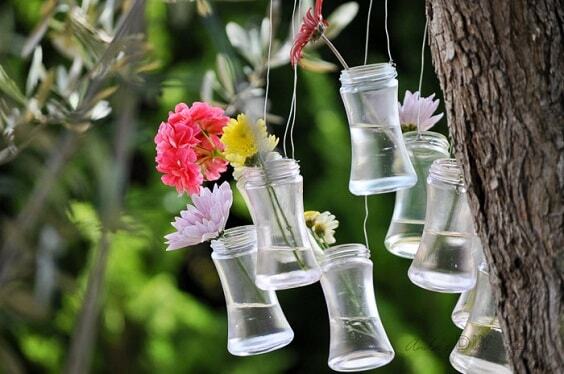 Turn your outdoor living space into a fairy tale’s chamber with this simple DIY patio decoration ideas. The materials that you need to prepare are only some glasses or jars and transparent glass paint. The place is always a nice addition to every patio, and this DIY patio decorating ideas look so tempting to try. 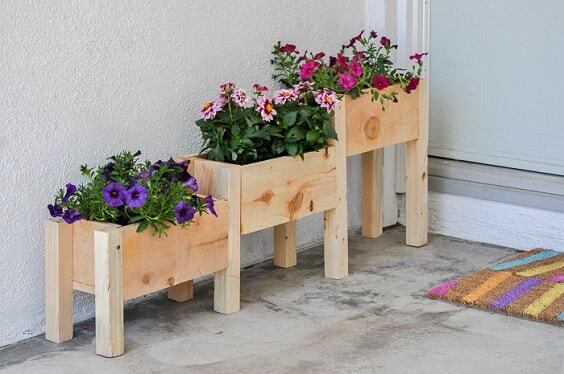 It’s a tiered planter which is made from wood in rustic look which is so admirable. 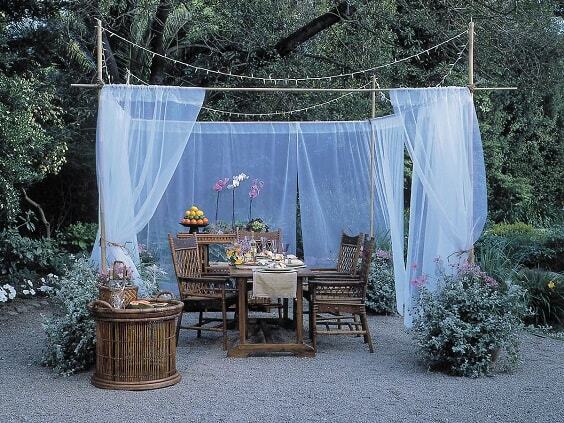 So those are some inspiring DIY Patio Decoration Ideas that we have picked especially for you. You can try the one which suits your needs and budgets. Those projects can be a super fun thing to do this summer to make your outdoor living space feels more enjoyable. 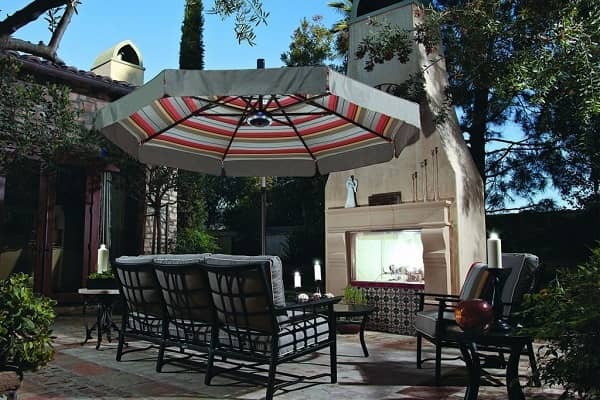 The patio is always a good spot to stay around to enjoy the summer breeze at you own home. It’s never a bad idea to make your own patio decoration instead of buying one since they still provide the same benefits for you. 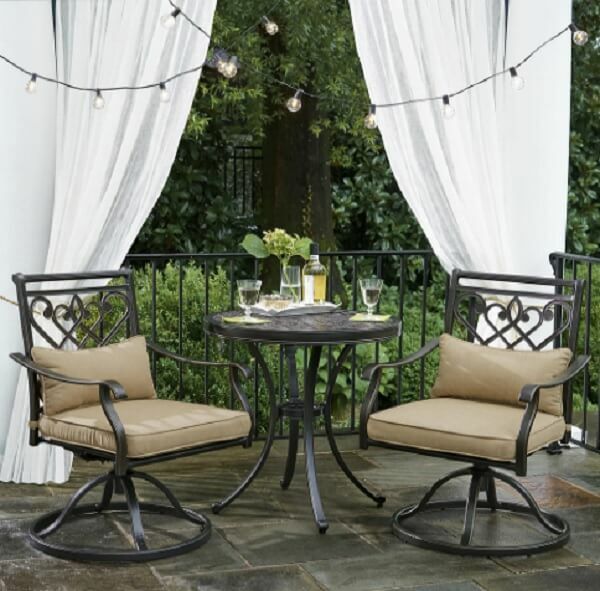 You can save lots of bucks to have a nice additional stuff that will make your patio feels more exhilarating. Keep in mind to use the basic safety gears like eye goggles and gloves when you execute the project. It’s such an important thing to always stay safe. 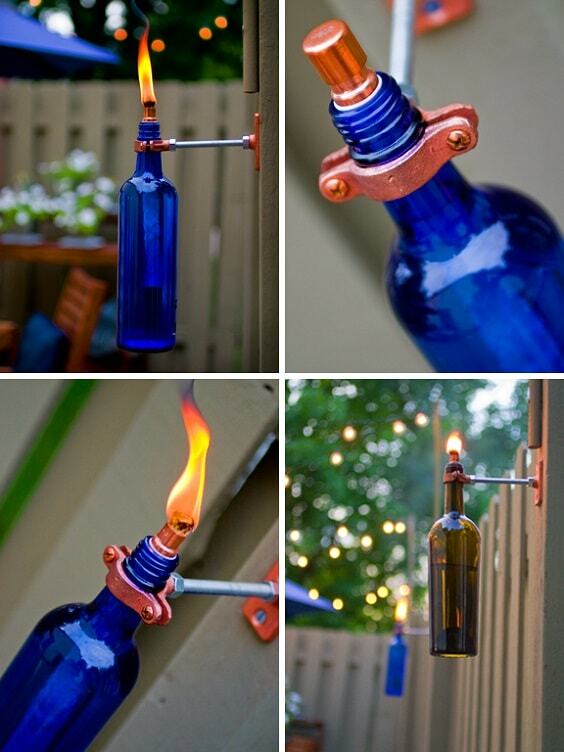 Well, happy creating your very own patio accessories!